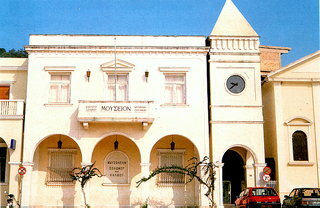 The Museum of Dionysios Solomos and Eminent Zakyntians was rebuilt in 1957. It has been in operation since 1966 and since January 17, 1968, the bones of the national poets, Dionysios Solomos and Andreas Kalvos repose in its Mausoleum. The Museum consists of the following: the ground floor are the Dionysios Solomos Room, the Room of Eminent Zakynthians, the D. Romas Room and the Nicholas and Thaleia Kolyva Room, in which an important number of the manuscripts of the national poet Dionysios Solomos are kept, as well as some of his personal belongings, a rich collection of portaits of eminent Zakynthians, and an important collection of icons. The Museum also has a well-stocked library containing a large collection of documents, and also period furniture, an archaeological and folk art collection as well as a collection of photographs.